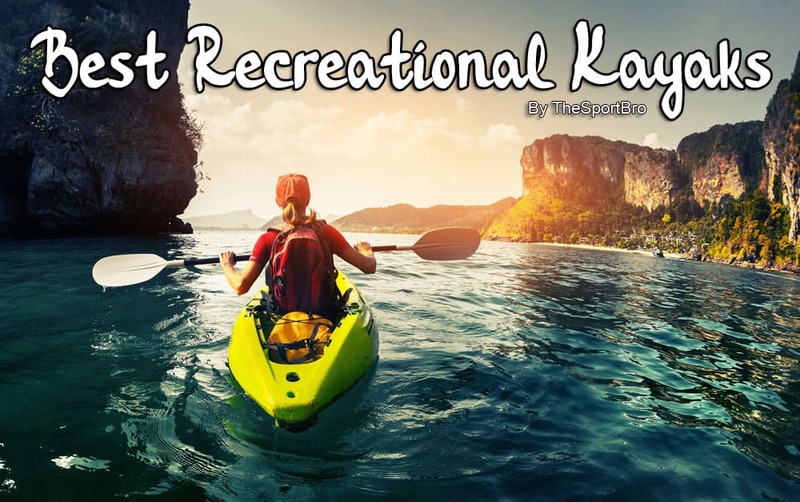 5 Best Recreational Kayaks To Get For Every Type Of Relaxation In Every Price In 2019. So the kayaking bug has hit you, something about the water just calls you, it relaxes you. I get it. You want to get yourself a nice recreational kayak that will fit your needs and for your budget. Trust me when I say this, For a perfect relaxing day out in the water you only want the best recreational kayak you can get. Don’t want to be out there with a piece of crap. Now if you have been researching this enough you probably already know how expensive these kayaks can be, which is why I have tried to include from every price range which fit our relaxation goal. Before we jump into the reviews let’s get somethings clear, like what type of kayaks we think are perfect for a recreational paddler. The weight and size of the Kayak matter a lot, simply because unless you are living next to a river front you will have to carry the kayak to the waters from your home on top of your car or special vehicle. Now traditionally recreational kayaks were heavy and big. They were hard to carry but with new upgrades in the industry, Newer Kayaks are more lighter and easier to travel with and don’t have to cost that much. If you are going out to relax, you definetly want to bring some food and drinks with you. Now as there are so many types of kayaks, we will narrow our search to those in which you can store extra stuff. This is a very convenient thing that we have to surely have in our selection, out in the open having a snack.. That experience is something else. Most of our selections are either for one or two people, since that is how usually go relaxing. The advantage in having either C-1 kayak or C-2 Kayak is that they are cheaper, lighter and easier to control. This makes your relaxation experience even beter. These are our main criteria with which we have selected the best kayak for recreational purposes for you. Let’s begin with our reviews so you can quickly select one for you. I am not kidding when I say this kayak is Cadillac of all kayaks. It is definitely one of the most superb ones out there and you will enjoy every second in it. Now Old Town is already quite famous for there canoes and kayaks for the quality they provide so it should be no surprise when we say that the best under $1000 is an Old Town Kayak. This kayak is small enough that you can squeeze into tight spaces and light enough that you can carry it easily but just because it is small and light does not mean that it is not any good for you. The Old town’s stabil-form hull design and it’s overall design make it very robust and easy to be in. It comes with couple of drink coolers in the bow. These are amazingly convenient as you can have your drinks within your arms reach at all times. It also comes with a glove box hatch, to store all your important stuff like phones and keys all nice and dry. Again in a convenient position. The stern is equipped with a large storage area covered in full hatch of course to keep all the stuff that you want to take with you. It is built for sheltered waters so you can have the best experience when you are trying to relax. It also comes with there own Glide track force brace system and comfortable grip thighs, this helps with initial stabilization and keeping relaxed. Even when testing, this was the best recreational kayak. The entire kayak has been built to ensure that you can have the most relaxing experience when out in the waters. Because of its size and features the kayak is also great for beginners, so if you are just starting out and already want a kayak that is best then this will definitely be to go for. This kayak is super compact, easy to maneuver(because of its hull design) and lightweight. On top of all of that it has multiple storage compartments where you can store all the stuff that you want to take with you and not have it get ruined. Alright it is great for you but what about waters? Well it is built for sheltered, calm waters. So amazing in ponds, lakes and flat waters but if you want to take it to moving waters or rough waters it will not hold up much. This is because of the size and hull design, it is built for beginners and as such wants to be used that way. The vessel itself provides a complete comfortable experience for those who are just beginning or want to relax. Which means if you decide to take it to rough waters you wont be able to control or maneuver it. It also comes with a molded rudder which does an amazing job stabilizing it in waters in low to mild winds. Even if you were to get caught in rough winds it will keep itself well stabilized for you to take back control. Now when you are spending your day in calm waters, having a comfortable seat to keep you all relaxed is of utmost importance and that is why Rodrigo has one of the best seats that you can get. Comes with large storage space along with key/phone holder and cup holders. Light and small enough to carry easily. Cadillac of all kayaks when it comes to performance. This sit on top recreational kayak is perfect for occasional paddlers who are looking for something light weight which can also handle occasional minor waves. Built with triple form hull for stability and maneuvering, it balances itself well in calm and rough waters while still being easy to maneuver. 4 drain holes helps the kayak self bail if you were to get caught into rough waters. As our goal here is recreational lets talk how it is a perfect sit on top recreational kayak. Molded in seat with padded cushion provides comfort on long days in water while bow storage hatch ensures that you can always reach your stuff easily. Bow storage hatch also stores decent amount of stuff for its space. Stern has open storage with bungee straps for all your gear storage. It also has handles on either side for control and grip if you were to get caught in rough waters. It also comes with molded in cup holders to enjoy your drinks out in the open. Talking about the size, it is 11ft in length but with weight around 49lbs, it is light enough to carry easily anywhere. Talking about some extra features the fact that this performs so well in calm and rough waters is truly commendable. If you are an occasional paddler who is looking for something that can perform well when in rough waters and in calm waters while still being cheap and made of good quality then this is the best recreational kayak to go for. Maintains and balances itself well in rough waters while still being easy to maneuvre. Can also be used in minor waves. The bow has strap down hatch. If you are looking for something that is a bit more smaller in hull size and also light in weight while still being cheap enough for an occasional flat water ride, this C-1 is the kayak to go for. Hull Made out of linear polyethylene is 11ft in length and 27ft in width while maintaining 15ft height. It is a sit in kayak but is made to be super comfortable for occasional calm water paddling. It also has molded in rudder that works very well in keeping the boat at course and since it is made for calm waters it does the job very well. Although you might not expect much from it when maneuvering it holds its place and maneuvers very well and quite easily. Zydeco 11 while might be small it is perfect for situations where you have to carry it out and to water or have to make a wet exit. It is light enough that you can just pick it up out of tough spots and take it to where you want. The thigh braces are unfortunately not present in this kayak but even without them maneuvering and controlling it is simple and easy. Cockpit feels tight and comfortable for a good day of relaxation and chilling in the waters outdoors. Initially you might have to get used to the cockpit but within first try you get used to it. So when getting into it for the first time this is something you have to keep in mind. For the best recreational Kayak, Zydeco 11 is perfect. Beginning with the cockpit it is tight and comfortable while still being roomy to have freedom. The tightness helps maneuver the boat easily and comfortably. The cockpit is also well designed for flat waters. The adjustable padded seat is very comfortable for long days in the water. Zydeco 11 tracks well while still being easy to maneuver. It also comes with a stern hatch and bulkhead which provides a large storage space to carry as much stuff as possible for a day in water. Overall for a recreational day, it is comfortable, keeps all your belongings dry and tracks well while still being easy to maneuver. Cheap and well worth the money. Hull design along with molded rudder tracks very well while being comfortably being able to maneuver. Stern storage space is large enough to store days worth of stuff. As mentioned ealier Old town produces some of the best kayaks for everybody. This includes recreational, fishing or just general kayaking. Heron 9XT is no different from other quality kayaks by Old Town. As with our other recreational kayaks this one too is meant for flat waters and calm waters. I personally do not go into rough waters on days I want to relax but if going in rough waters relaxes you might want to check out other best kayaks that are meant for that purpose. Heron 9XT is an upgraded model of Heron 9. The base model is quite simple and cheaper but it is not exactly perfect for our purpose here. 9XT whereas comes with a lot more features and comfort that puts it right in our list. Starting with material it is built with single layer polyethylene which enables it to be lightweight while still being sturdy. Though the length is only 9ft the cockpit is large enough to be comfortable in. The deck height is at 33cm and weight coming around at 39lbs. The size and weight combination of heron 9XT makes it very easy to travel and transport it. So if you are somebody who stays far from shore and don’t want something that is heavy, or huge then this is the one to go for. The cockpit also comes with adjustable padded extra foam seats that are very comfortable and also adjustable track braces and thigh braces for comfortable maneuvering at leisure pace. One of our big requirements is storage space, and it delivers on it. While the base model heron 9 does not come with stern hatch, 9XT comes with a bulk head equipped with stern hatch click and seal. The storage capacity is quite big and with its click and seal power keeps everything neat and dry throughout your journey. For somebody who is looking for a small, lightweight and cheap recreational kayak yet a strong sturdy one that tracks well, Heron 9XT is the one to go for. Due to its size and weight it is easy to carry it to open waters and with amazing tracking easy to maneuver as well. The giant storage space enables you to store large amount of stuff. Overall if you are looking for something convenient for cheap price to get started in this is the model to go for. This upgraded model is well worth the price. Adjustable extra foam paddded seats makes it very comfortable to sit on for long periods of time. The thigh braces are also adjustable for greater control. Large stern space allows for large amounts of storage. Lightweight and small to easily transport from one place to another or in portage. Not good for beginners as it is known to fail in tracking sometimes. Let’s get down to the cheapest and most effective kayak. At this price point you probably won’t get a kayak made out of polylethene but that is ok. If you are only going out in the waters on occassions or just don’t have the space for to store those what are you going to do? Well the answer is inflatable kayaks. Inflatable kayaks are pretty awesome if you think about it, they are so easy to carry you can literally carry them in a bag and store them easily in your apartment. The biggest benefit of inflatable kayaks is the price, they are cheap specially when compared to there $500+ counterparts. Ofcourse even in inflatable kayaks there are many varieties and the prices go up as there is better quality with more features but for $150 and under category we thought Sevylor Fiji Travel kayak is the best one to get. Made of 22 gauge PVC construction it is high quality while providing thick material to maintain you and your companion on the water also against any damages. The valves are located in a convenient place can easily be opened to inflate and deflate the kayak. It comes with a paddle and a convenient carry case. This kayak is however strictly made for calm waters and can cause quite a chaos in rough waters or in heavy winds. For now if you are looking for something cheap and durable and don’t really care about any features as such then this will be the one to go for. Priced under $150 makes it a very good inflatable kayak that you will surely enjoy. Small, easily carryable even in portage or from home to shore. Can be stored folded in a small box, does not too much space for storing. Made of good thick material. Strictly not meant for rough waters. These were our selections for best recreational kayaks in 2018 for different prices, I am sure you found something that you were looking for if not or have a suggestion feel free to add it in comments below.